Wind blasted hail. Rain. Sleet. Sago snow. We’d chosen this. To go in while the weather was bad and then if things went to plan and the forecast was accurate our journey could be completed in a good weather window before the next front hit. We hiked up and the weather cleared at the top of a steep section long enough for us to put skis on before raging again. 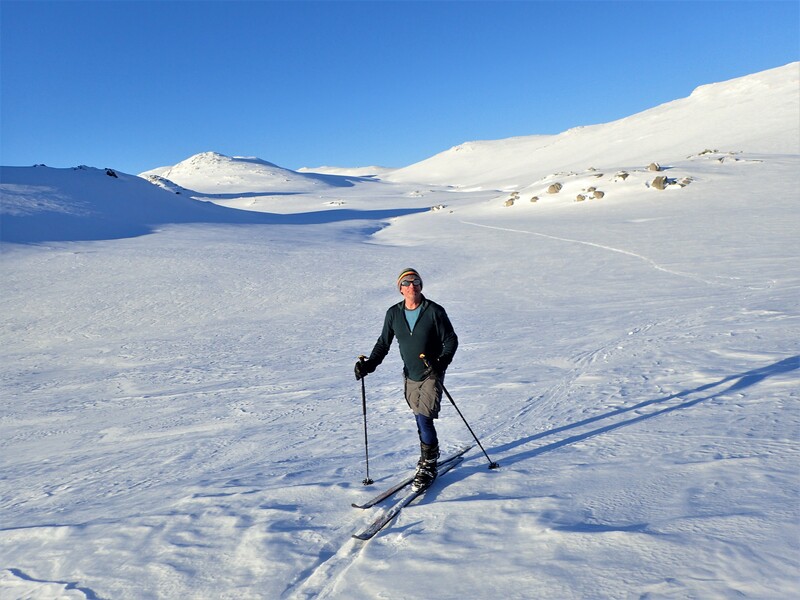 A couple of hours undulating up a fire trail brought us to a final flat section for the day where an Antarctic blizzard blew us off our feet on sheets of ice as we pushed to an old stockman’s hut at White’s River. Any remaining psychic cobwebs flew off with the wind. Shelter from the storm. Chimney smoke. Warmth. An army adventurous training group had the fire going. We settled in, drank tea and soup and played chess and chatted. Outside snow bucketed down. Steve and Charles and I. Charles and I had attempted Mount Twynam a couple of weeks before. I’d worked with Steve for 8 years prior to us both retiring. While at work we’d talked often about doing a trip together, like the light at the end of a long tunnel. Here we were at last bringing our plan to fruition. The plan was a good one. All that was needed was for the weather to clear overnight and hold for the 3 days we would need to get over the Kerries Range and on to the summit of Mount Jagungal and then return. Jagungal. The Big Bogong. 36 years it had been. 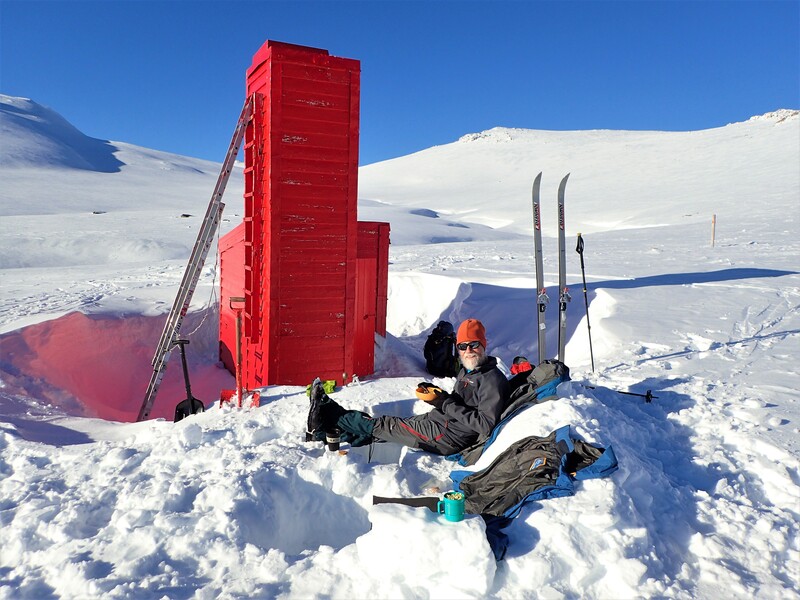 My wife and I had cemented our relationship on a week long journey on skis that included a night camped on a grassy patch under the stars on its slopes. Family legend now. Jagungal sits isolated in a wilderness area. Visible to those who know its shape from afar in any direction. 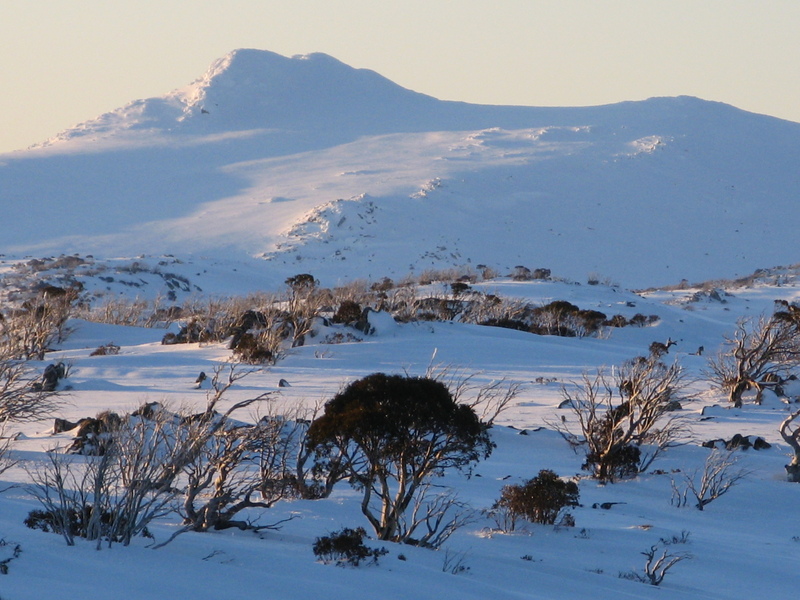 It’s a revered peak for bushwalkers and reserved for the adventurous few in winter who luck out with the weather long enough to summit and return to safety. 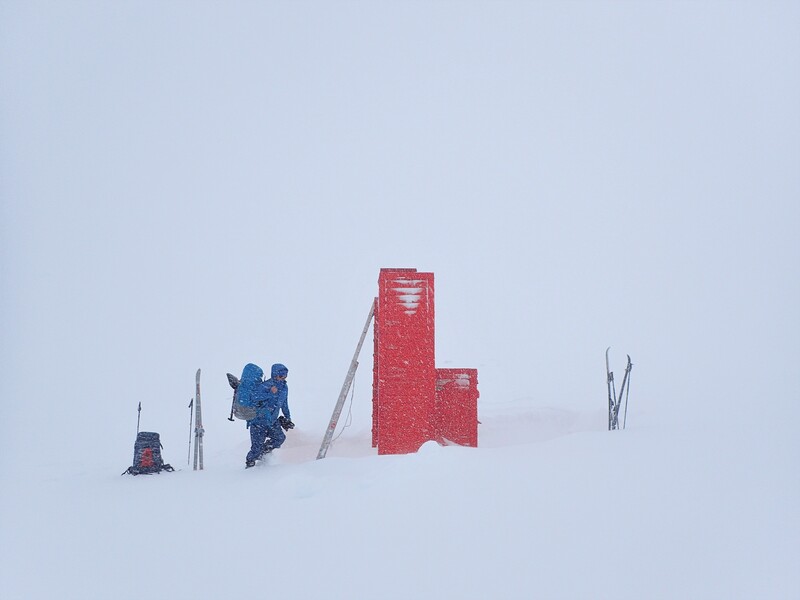 Navigation in bad weather is difficult. There is no easy way in. 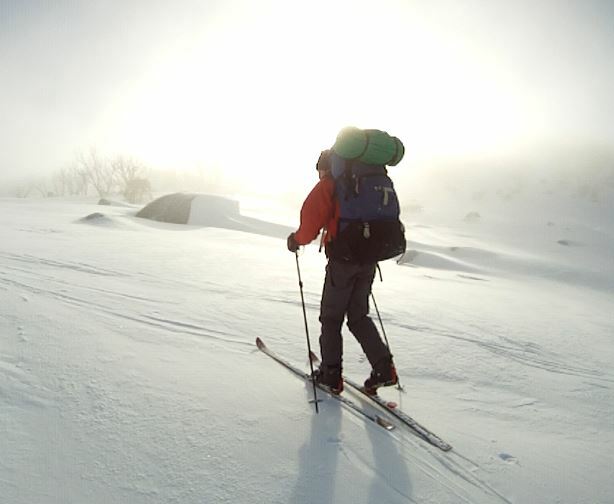 With full snowcamping kit for us the trip in and out would take 4 days. The group of young army officers were training to become alpine instructors. They cooked inside then slept in tents outside around which they had constructed elaborate sheltering snow brick walls. The hut had been refurbished inside. It was not the rat infested atmospheric hovel it once was. Steve has been a teacher all his working life. Auto mechanics and metal engineering mainly. Helped kids weld and learn about motors. Helped kids finish school against the odds. Helped kids turn their lives around. Got them jobs. Not your regular teacher. Extraordinary. He played classical guitar and crafted them too. And very smart as well. The friendly army folk departed for their tents. We were enveloped by the darkness and the warmth from the slow combustion heater fire as the storm raged outside. Steve wrapped us in Milton from within his poetic archive. Perhaps he had sensed the paradise we might enter the next day and the knife-edge of loss we were tempting by changing the climate of this alpine land. Or maybe some other unfathomable from deep within himself. Our weather dreams came true. In the morning no wind. Clear sky. Cold and still. Like a paradise regained. 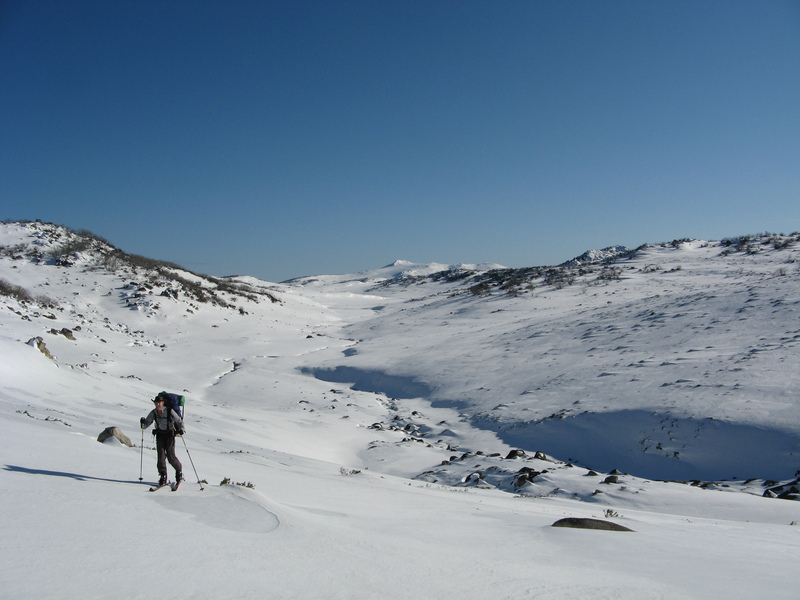 We climbed steadily through misty frozen snowgum copses and open snowfields to Gungarten Pass. 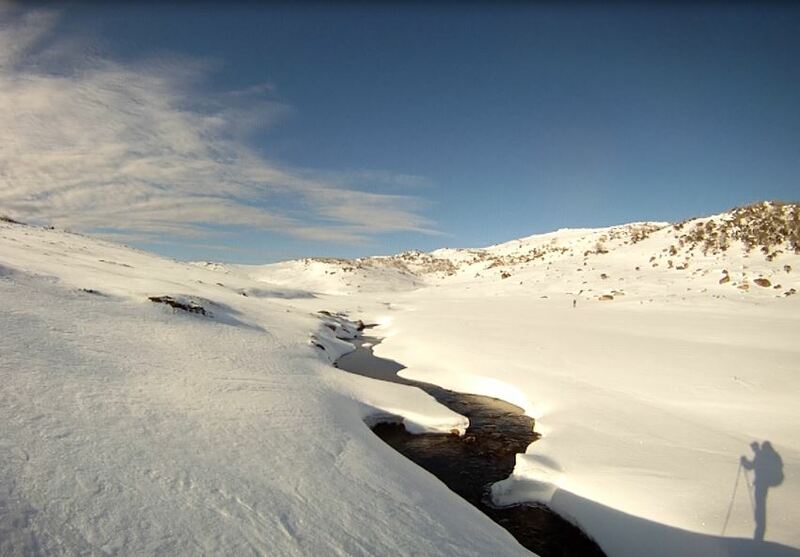 The bluebird day became hot along the valley of the Valentine River heading north. It had been a weird season up till then. Fronts started warm with rain then developed into colder temperatures and windy snow. The landscape was alternate ice sheets of frozen rain saturated snow and long patches of fine dry powder. Jagungal appeared as we rounded a bend into a broad open flat plain where we lost the lie of the river somewhere below us under the snow and ice. Heavy packs. Sunscreen. Sweat. The Kerries Ridge paralleled our route in the west as we made our way past the Brassy Peaks and Cup and Saucer Hill to Big Bend. The mountain became a companion beckoning us forward. Across a low ridge then down and across the Geehi River on a solid snowbridge. Up onto the Strumbo Range that led to the peak. The day was long but the mountain had come within reach. We camped high up on a flat section with views to every horizon. Late afternoon light turned the summit gold and glowed the spectacular Main Range in the distant south. Just before sunset I climbed a little higher to a rise from where I could take in the whole upper part of the mountain. It was stunning. Untouched. Pristine. White. Smooth fresh slopes as yet untracked. Aloof. Still high above. A sacred mountain. Like Machapuchare and Meru. What makes a mountain sacred, special? Like the mythical Mount Olympus Jagungal is part of my personal story, my narrative myth. In this part of the world it is one of the tallest peaks, reaching towards the stars. Like Kailash it is the source of major rivers, the Geehi and the Tumut, which flow into the Upper Murray. 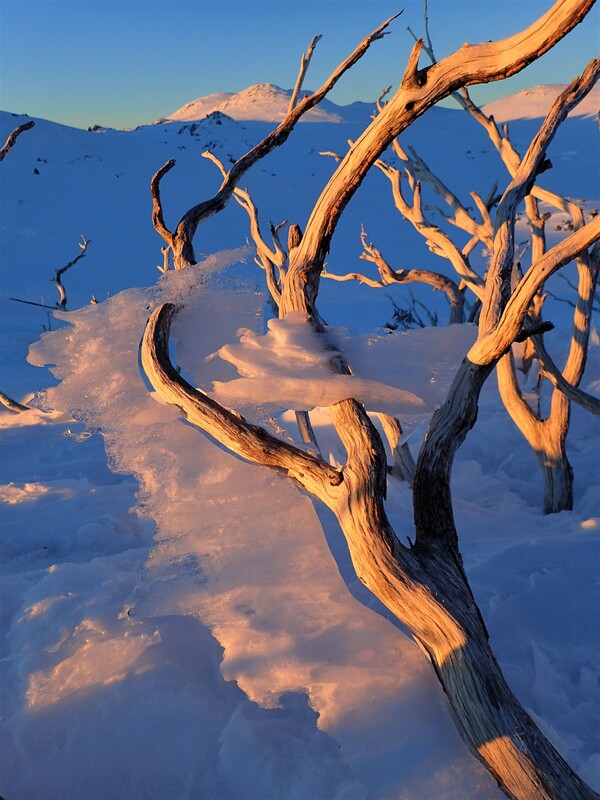 For tens of thousands of years Aboriginal groups, the Ngarigo and others, have come to this mountain to feast in summer on bogong moths and meet in ceremony on its slopes. My own pilgrimage with my friends, was richly layered with meaning. Emotion choked my words as I soaked up the place and connected to the outside world, telling Cath on the mobile that we were camped about a kilometre or two from our camp of many years ago and describing the scene for her. I was overcome with thankfulness that the world was so beautiful, that I could be in it, right there at that moment. 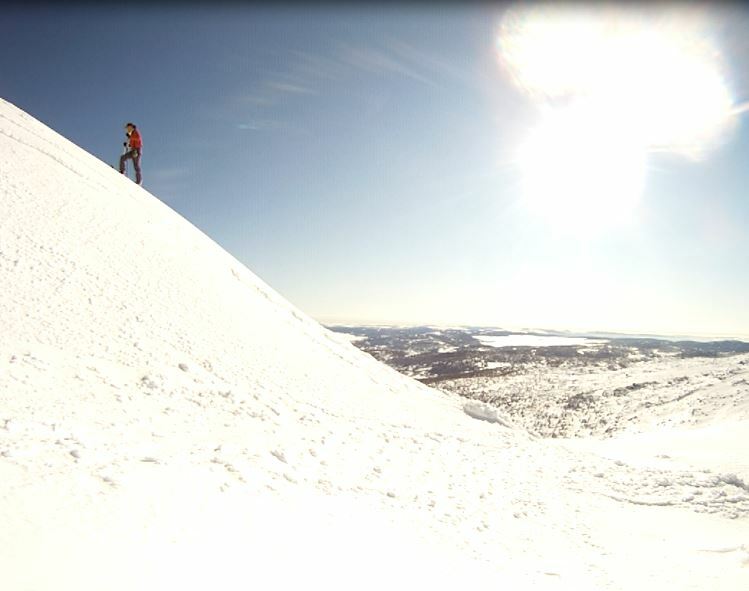 The approach across high slopes led to zig zigs up the steepening then skis off stepping up the harder icy snow to the top ridge. The view expanded with each step up. It was like climbing any “real” mountain. 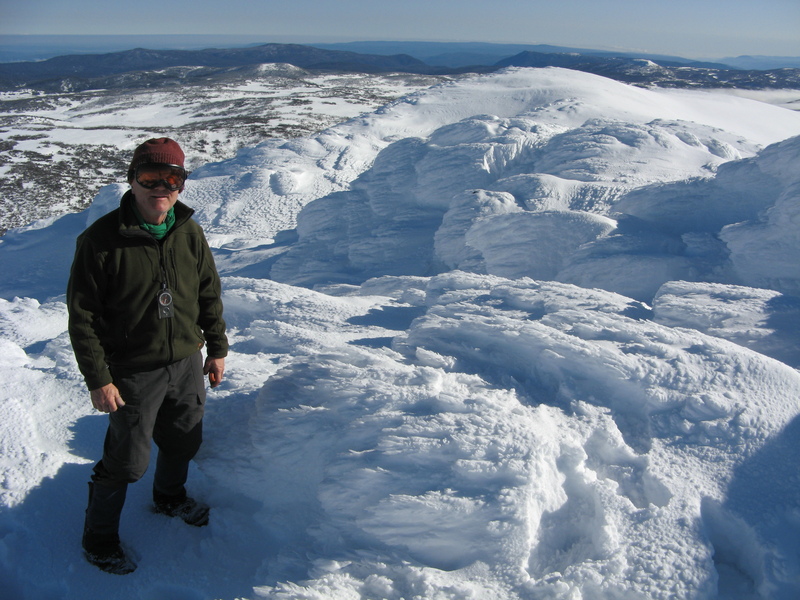 Windblown sastrugi between the east and proper western summit. We lost each other between mini peaks taking different lines. Charles skinned straight up the final section silhouetted against a huge sky. Then we were there. Whooping. The whole Monaro was under cloud below. To the north towards Kiandra the Happy Jacks valleys were clouded in but the forested hills poked through. Watsons Crags, Twynam, Kosciuszko and Townsend were dramatic, close seeming. 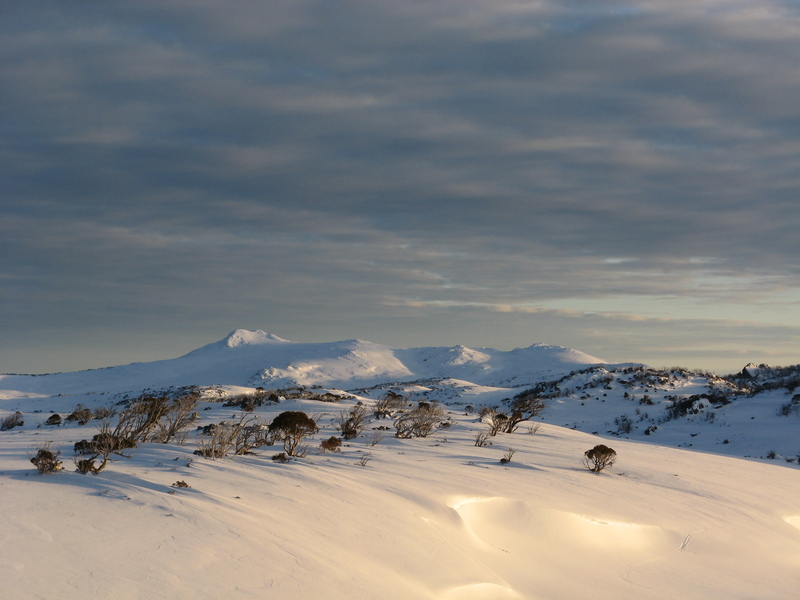 Mount Bogong beckoned in the distant south west as did the closer Grey Mare Range. Steve and Charles and I high fived. I was overcome again – reaching and climbing the mountain with Thearley, it had been a long time in the making, the feel of the perfect day, the natural beauty, support from Cath, coming back from illness, doing it just for me. The steep ski back down was icy and fast and nerve wracking. Back at camp we packed slowly, savouring the moments. We retraced our tracks back to Big Bend. 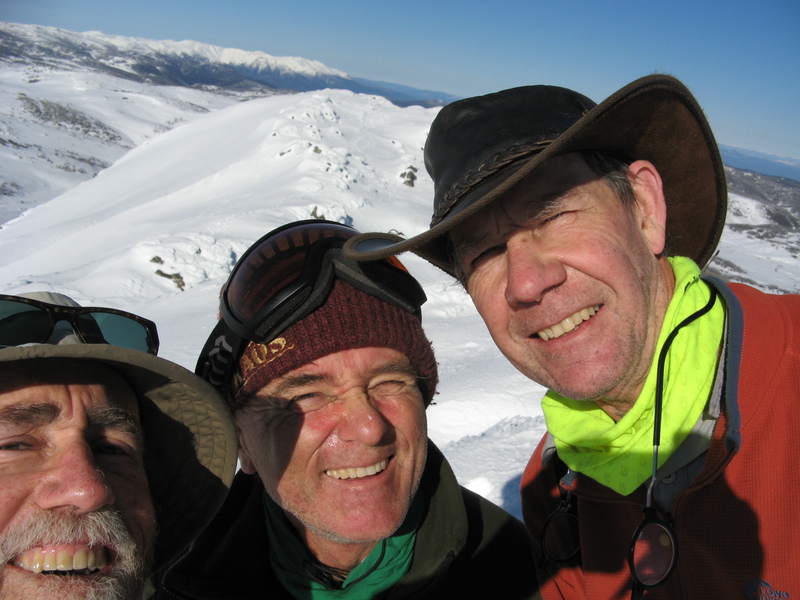 On the final section up to Mawsons Hut in the fabulous weather we discussed the death of Graeme Edinburgh. Like us he’d been returning from the Jagungal area with a mate, Greg. But in atrocious conditions. Without GPS, polartec and goretex. They had got near to Mawsons in a whiteout. Got cold and wet. Pushed on in search of the hut. Exhausted. Too late they’d given up their search for the hut. Made a snow cave. Froze up. Graeme collapsed and died in his friend’s arms during the night. Hypothermia. The story was drummed into us – uni students in the same club a few years later. Be conservative and safe. Take a good tent, good gear. Respect the forces of nature. I wonder now about his mate. The impact then and over the years. His family. Over a brew we talked to the others passing time at the hut. 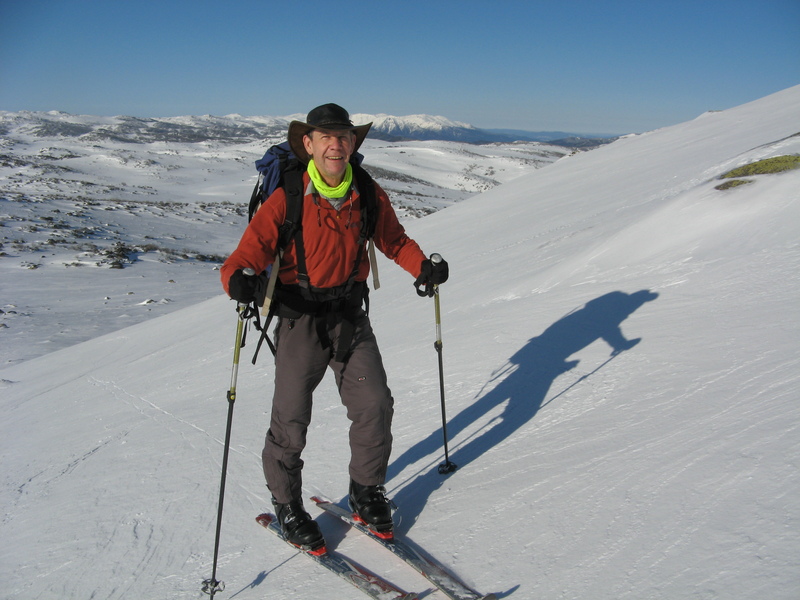 A 72 year old guy who had taken up ski touring 4 years prior. He had the best lightweight alpine touring gear money could buy to go with the catamaran he’d solo sailed around the world. Tall tales and true. 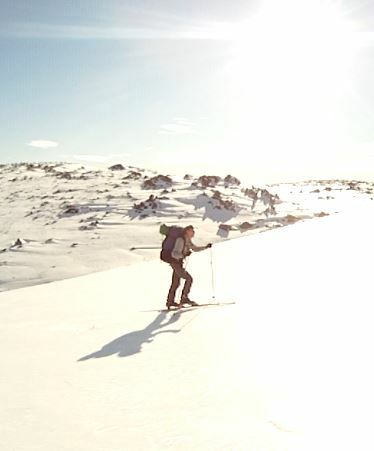 And a younger, fitter fellow who was skiing from Munyang to Jagungal and back to Munyang in one day. He had turned around ½ an hour from the summit to ensure a safe return. Impressive self-discipline. I went for a quiet ski in the late afternoon. Sounds of the Valentine River in the valley below broke the silence. Rocky hills opposite glowed golden. Jagungal lay quiet and still in the distance. More stories in the warm cosiness. A celebratory whiskey. And Steve again in the candlelight…..
Day 3 – Strumbo Range to Mount Jagungal to Mawsons Hut. 12 km. 8.30 am – 1.00 pm. The older fellow left for Cesjacks Hut early. On a hunch Steve followed the tracks he had left on a suspicious sortie just before his departure. Hidden in a tree bowl nearby was a large bag of his yucky assorted rubbish. It was hard not be angry with such flagrance. Back along the valley of Valentine Creek we threaded the best line that linked up the powder fields, trying to avoid the ice sheets. The white brightness was severe. Sunglasses, hats, long sleeves, sunscreen. Mounds and cornices and snow covered boulders cascaded down from the Kerries Ridge high above on the west and the Brassy Peaks on the east seemed to hem us in. Sublime beauty. Occasionally the creek appeared and bubbled downstream. White, dazzling white, grey and brown rocks, colours frozen out, covered in white, soft white, shining white, white reflecting, smooth, crunching white, silken white slopes, wedding cake white. And the white mountain now behind. Under a sapphire blue sky. In a way it was like a hostile desert, lifeless, still, intense. Every minute, every hour gliding and stepping the white landscape etched deeper into our psyches. Our fourth day immersed. Such a treat. 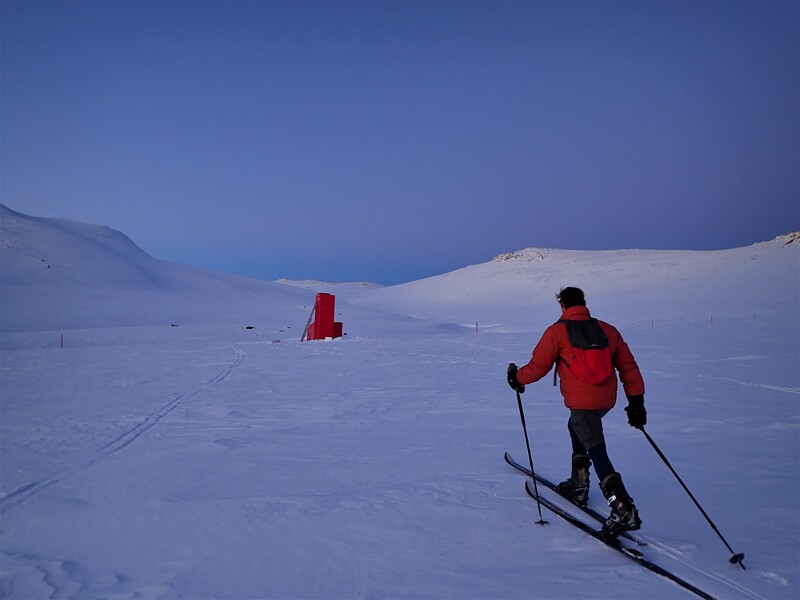 As I followed in Charles’ tracks I marvelled at other friends’ journey across the Antarctic – 66 days on the ice, all in white. We crested the ridge through a scene from the Arctic. Boulders were festooned with wild growths of ice to windward. Wind blasted snow had iced up and built through each of the season’s winter storms. In the fore and middle ground were snow covered peaks and ranges. Lines of blue hills stretched off to the horizon in every distance. 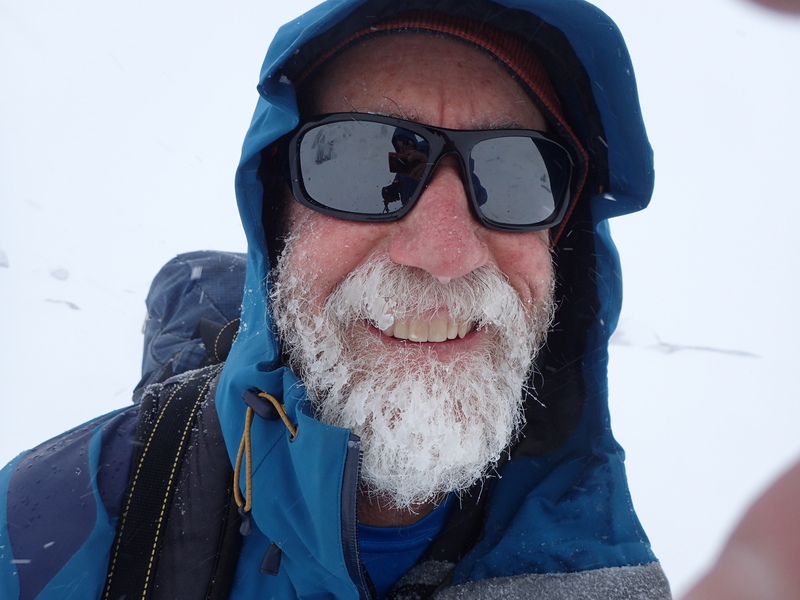 I held Jagungal in a farewell gaze for a long minute then stomped down through the lumpy ice field with Steve while Charles cruised down on his heavier ski gear and better skills. Lower down in the valley above Schlink Hut we struck perfect snow and whooped and ss’ed the bowls and delighted ourselves in the day, in the conditions, in the place and in the world in general. We lunched in the hut with a young man whose job it was for 2 months to ski various routes through the back country laying baits for foxes. 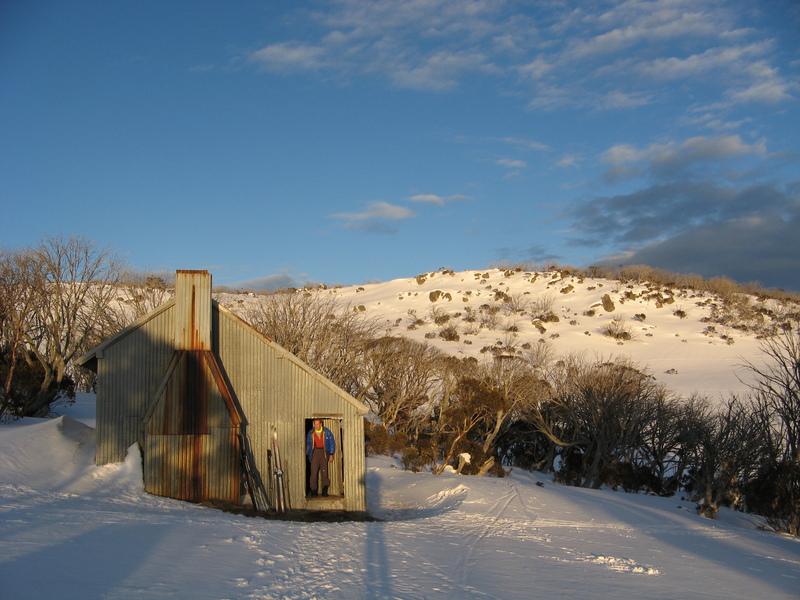 I had nearly burnt Schlink Hut to the ground decades before. Having arrived in a blizzard late and exhausted I had set up my stove on a table then filled it with shellite. I placed the fuel bottle safely down at the other end of the table, pumped up the choofer and lit it. Flame shot down a line of fuel I must have spilt along the table to the bottle which caught fire along with my hand which must also have been covered. “I’ve seen one of those explode!” yelled someone in the crowded hut which emptied immediately outside into the howling storm in their pj’s and thermals. I was mesmerised by a painless hand on fire. A friend had the sharp presence of mind to rip down the curtains and smother all the flames before they caught hold of the hut and me. The ski back down from the mountains from Schlink Pass was glorious. Nice soft snow. Occasionally the grey deadwood forests of tree skeletons from the 2003 fires were interspersed with oases of old green snowgums. 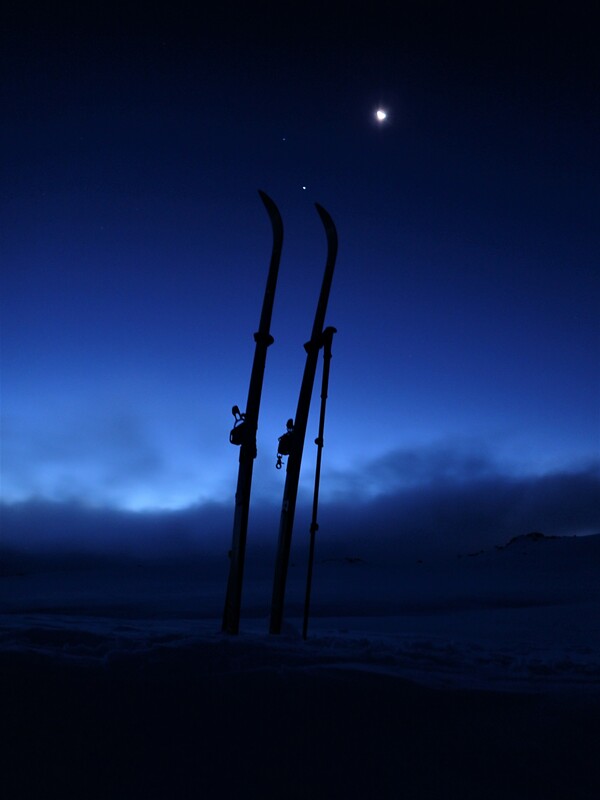 Skiing slowly along in my internal world I committed to a plan for the future. 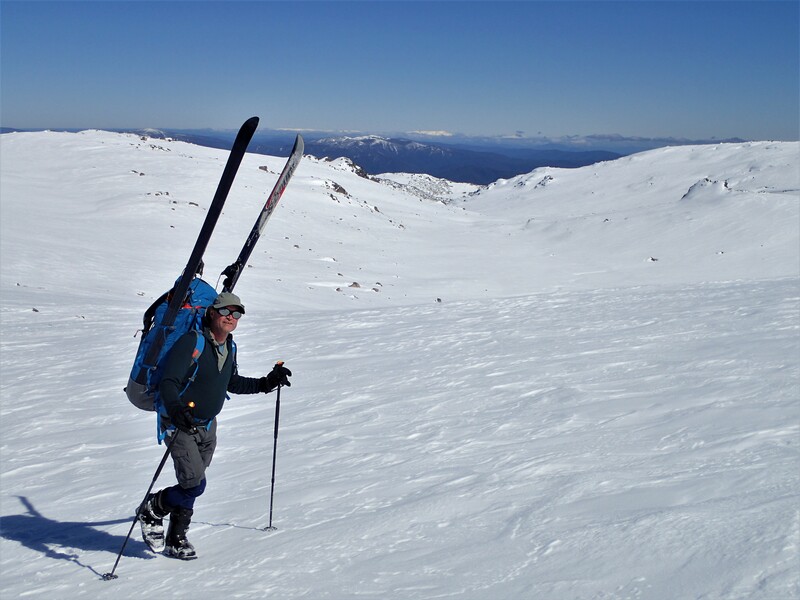 To ski and climb my own “seven summits”. 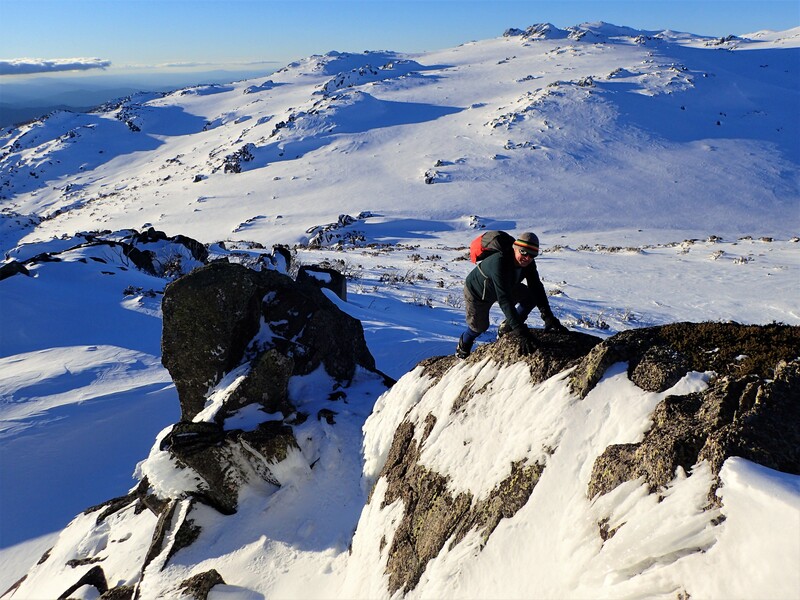 The seven winter alpine summits of mainland Australia – Kosciuszko, Townsend, Twynam, Bimberi, Bogong, Feathertop and Jagungal. Already this season I had failed on one and been successful on another. Arguments could be had over the selection but in my mind these represent the most iconic mountains of the highest dozen in Australia. A fine adventure challenge which doesn’t involve burning masses of fossil fuels to get to far flung exotic locations round the world. If each provided a small proportion of the pleasure and satisfaction of this Jagungal journey then they would be worthwhile. Arrival back at the car, at civilisation, back in the world of colours was anticlimactic compared to the brilliant white intensity of the alpine high country. On the way home we chatted about another trip next year. A shower of rain marked the closing of our weather window. Everything had gone according to plan. This time we were lucky. 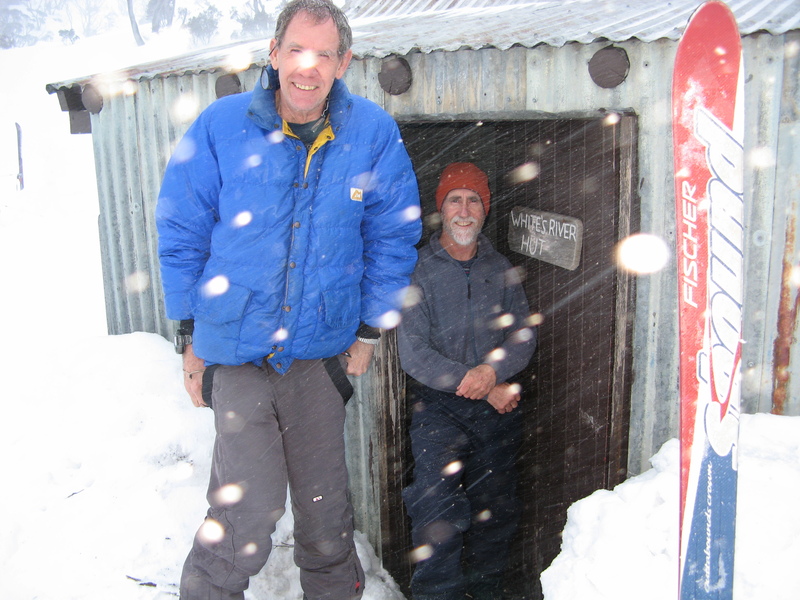 Day 4 – Mawsons Hut to Munyang (Guthega Power Station). 19 km. 8.00 am – 2.00 pm. Total journey – 58 km, 3 ½ days.